You've probably heard me mention this guy a few times. We love his radio show. He's always talking about living on "Bean and Rice, Rice and Beans" (mostly figuratively) while you're trying to pay your way out of debt. Here's a nice little article on that. This black bean mixture is great as a filling in cheese quesadilla as well - originally got the recipe from this website. Sautee bell pepper, grated zucchini, and red onion in a little olive oil and minced garlic. Add some drained black beans and fresh cherry tomatoes. Fill your burrito and belly with this deliciousness. After your rice has finished cooking, throw in a can of drained sweet corn, and some fresh cilantro (if you don't have the unfortunate soap taste thing going for you), some sauteed sweet or yellow onion, some fresh cherry tomatoes, and some seasonings of your choice to make the rice more flavorful. Serve your rice and beans in (cooked) uncooked flour tortillas. Or, if you want some crispy tacos, fry your own small corn tortillas in a thin layer of canola or vegetable oil. Cook 1 lb. 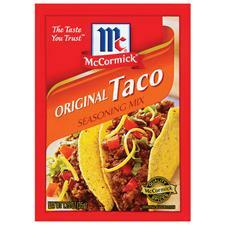 ground hamburger with McCormick original or mild Taco seasoning. (Just follow the directions on the packet.) Then, add two cans of nonfat re-fried beans and two cans of drained black beans. When heating up canned re-fried beans, add some Lime juice to thin and flavor the beans. Try one can of pinto beans, and one can of black beans mixed together for your bean filling. Serve your beans and rice in a taco salad over your favorite tortilla chips. Serve your beans and rice in burritos or tacos (or taco salad) with sour cream, grated cheese, fresh cilantro or thinly sliced romaine or Iceberg lettuce, guacamole or avacado, fresh garden salsa and some of your favorite hot sauce. What are some of your favorite ways to eat beans and rice? Ummm, hello yumminess! I'm totally making these. Sooo easy and the tex-mex taste is right up my alley.